On November 17th, 2012, Falun Dafa practitioners received a warm welcome at the annual Winnipeg Santa Claus Parade, the city's largest decorated float parade. The parade has continued to attract thousands of spectators every year during its illustrious 103-year history - and this year was no different. Due to the unseasonably warm weather, many families arrived at the parade grounds hours before its scheduled start. Composed of over 200 floats and processions, the parade took about two hours to complete its circuit. Local officials estimated that there were about 6,600 people in attendance. Even before the parade started, a lot of passersby were drawn to the Falun Dafa float, which consisted of a celestial maiden atop a large, beautiful lotus flower. 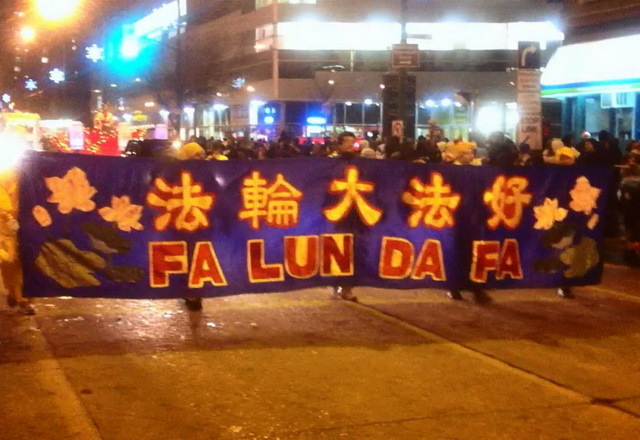 Three large lanterns adorned the front of the float with the Chinese characters for “Truthfulness,” “Compassion,” and “Forbearance.” Leading the Falun Dafa procession, was a 23-foot-wide banner with the words “Falun Dafa” decorated with small lotus flowers. Along the route, a lot of people cheered, “Falun Dafa!” and loudly cheered. Both young and old alike waved at the Falun Dafa procession. Some people exclaimed, “The float is so beautiful!” Practitioners passed out many fliers explaining the practice of Falun Dafa. They also prepared 1,000 colourful bookmarks with small lotus flowers attached, and the words, “Falun Dafa” imprinted on them. The small lotus flowers were the favourite spectator gift in the parade and were quickly handed out within less than an hour.